Moreland City Council is seeking an experienced professional to take on a key role in the Open Space Maintenance Unit, to grow the Urban Forest in the municipality and delivering on commitments of its Urban Forest Strategy 2017-2027. This is a fantastic opportunity for an individual who has a good knowledge of trees and vegetation combined with sharp and innovative strategic nous, to deliver longer term and sustainable outcomes. The candidate will relish the opportunity to step into a brand new role, working with a dynamic team and enjoy contact with the community. You are required to have a Degree or Advanced Diploma in Arboriculture (AQF Level 6) or equivalent. Experience in a similar role in local government and expertise in the management of an urban forest would be advantageous. Applicants need to address the key selection criteria from the position description to be successful in this role. We are an equal opportunity and child safe employer, support inclusiveness and diversity, and are Values based. Moreland - One Community Proudly Diverse. Robninson Reserve Community Garden is underway! There is exciting progress to share regarding the upcoming Robinson Reserve Community Garden! Council has prepared the site and the construction of core infrastructure (i.e. 6 raised garden beds) has begun. This first stage will be carried out every Friday over the next few weeks. 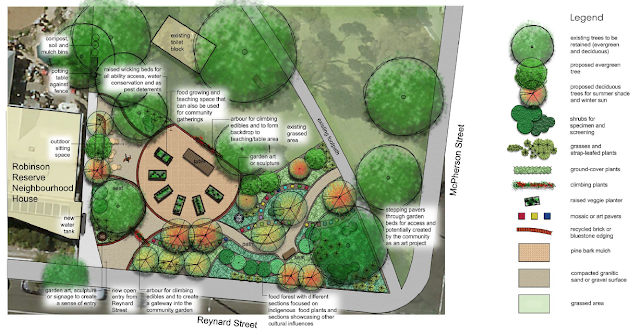 The current, staged garden design is included below. Once this construction stage is complete, the garden will be handed over to the community for planting and nurturing. You are all invited to attend a meeting to discuss and get involved in the next stage of the garden on Thursday, 15 March, at 7:30pm at the House. This meeting will be to discuss the roll-out of stage 2 and beyond. RRNH will be available for support and coordination, however a community-led committee will need to be established to ensure the running of the garden. We would appreciate you forwarding this to anyone in the area who you think may be interested. If you are interested in being involved please email admin@rrnh.org.au.